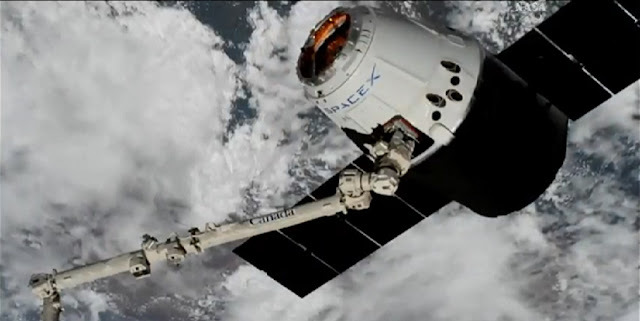 Two days after its launch from Florida, the SpaceX Dragon cargo spacecraft was installed on the Harmony module of the International Space Station at 9:00 a.m. EDT on Wednesday, April 4. Among the research arriving to the U.S. National Laboratory is a Metabolic Tracking investigation to evaluate the use of a new method to test, in microgravity, the metabolic impacts of pharmaceutical drugs. This could lead to more effective, less expensive medicines on Earth. The Multi-use Variable-g Platform (MVP) will serve as a new test bed aboard the space station, able to host 12 separate experiment modules with samples such as plants, cells, protein crystals and fruit flies. The Center for the Advancement of Science in Space (CASIS), which manages the U.S. National Laboratory, is sponsoring the investigation and the MVP.